Here are a few more pictures from my recent trip to my in-laws. 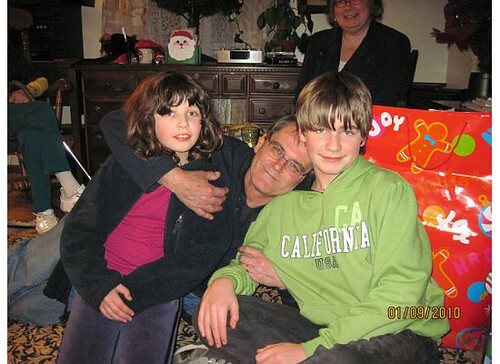 Here is the kids with their uncle. He's kinda a goof ball. 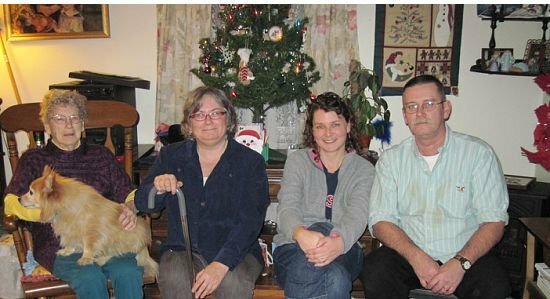 And here is my mother-in-law, sister-in-law, me and my husband. My in-laws were big into taking pictures that day. They wanted a picture of everyone. I kept telling them I don't like how I come out in pictures. And don't want my picture taken. My SIL then gave me a big speech about her friend. They did a lot of traveling together. And everywhere they went, her friend would not want to be in any of the pictures. Her friend died suddenly a few years ago. And when she looks back at all those places they traveled together, there is not one of her friend in them. She does not have any pictures of her friend! I finally agreed to have my picture taken. And I'm actually kinda happy how it came out. Visit Wordless Wednesday , 7 Clown Circus, Sunnymama, & 5 minutes for Mom for more participants. Nice to see some more pictures Sue. Can't get enough of family. I'm in the same boat.. Dislike having my picture taken (or I'm the one taking it) so I'm normally not in any photos.. I think your photo came out great.. I don't like having my picture taken either... your turned out great though! Those photos are great. My eyes are usually shut in all photos. Family pics are the best and to be cherished for sure! Those are really nice pictures! I don't like my picture taken either. Families are the best! Great photos. great pictures. It is great to be with family..
Great pictures! I hate getting my picture taken also but I let people take them incase something were to happen to me. A beautiful family photos. Aw, I'm missing my family. I only get a chance to see them every holiday season that's why whenever I'm with my family, I always take pictures of us, a lot of pictures. My dad would always joke me that I hate pictures, LOL.